The hub of MSC Meraviglia's top deck is the Atmosphere Pool, billed as the one of biggest pools at sea. The 82-foot-long Atmosphere Pool is rectangular in shape and features platforms suspended in the water. One deck up from the Atmosphere Pool are side promenades lined with deck chairs. Whirlpools cantilevered over the side of the vessel are located on each side of Deck 16 near the Atmosphere Pool. The Atmosphere Pool area features a giant LED screen that offers entertainment during the day and night. A contemporary structure that houses MSC Meraviglia's Sky Lounge rises from the top of the ship just behind the main pool area. A jogging track circles the back of MSC Meraviglia on Deck 16. More lounge seating can be found on tiered deck areas forward of the Atmosphere Pool. MSC Meraviglia features one of the biggest water play zones at sea, the Polar Aqua Park. Located at back of MSC Meraviglia on Deck 15, the Polar Aqua Park features three large, twisting water slides. The Polar Aqua Park's water slides begin from a tall white tower just below the ship's funnels. The Polar Aqua Park's water slides have translucent portions that offer passengers a glimpse of the ocean as they careen downward. As its name suggests, the Polar Aqua Park on MSC Meraviglia has a polar theme that includes a faux polar bear resting below its biggest water slides. One of the water slides at the Polar Aqua Park on MSC Meraviglia twists over the side of the ship. The adventure activities at MSC Meraviglia's Polar Aqua Park also include a 269-foot-long sky walk called the Himalayan Bridge. The Himalayan Bridge is a suspension bridge that winds around the back of the vessel more than 200 feet above the sea. Just below the main water slides of the Polar Aqua Park is a splash pool. A second, smaller outdoor pool is located at the very back of MSC Meraviglia on Deck 16. Called the Horizon Pool, it's in an area that transforms into an entertainment zone at night. The Horizon Pool area is flanked by an amphitheater of lounge seating that transform into an outdoor entertainment zone at night. MSC Meraviglia has a third pool area, the Bamboo Pool, which is features a sliding glass roof that can be closed during inclement weather. The Bamboo Pool area offers one large pool and four whirlpools. The Bamboo Pool area also is home to the Bamboo Bar, a fresh juice bar offering made-to-order concoctions. A sliding glass roof called a magrodome covers the Bamboo Pool. At the very front of MSC Meraviglia on Deck 19 is a private solarium and pool area for passengers staying in the ship's upscale MSC Yacht Club cabins. The private, deck-top area for MSC Yacht Club passengers includes a private grill and bar that is open throughout the day. The private deck for MSC Yacht Club passengers has its own pool and two hot tubs. The hub of MSC Meraviglia's interior is Galleria Meraviglia, a 262-foot-long interior promenade lined with shops and eateries. The idea of a central promenade on the scale of Galleria Meraviglia is new for MSC Cruises, which doesn't have similar spaces on its other ships. Only Royal Caribbean offers interior promenades on a similar scale. The two-deck-high Galleria Meraviglia is topped with a faux ceiling created by the biggest LED screen at sea. The images on the screen change throughout the day, and it's the site of spectacular LED sky screen shows three times a day. Among the bar options along the Galleria Promenade is the Meraviglia Bar & Lounge, which offers signature cocktails. Located at the base of the Galleria Meraviglia on Deck 6, the Meraviglia Bar & Lounge offers live music and a dance floor. Adjacent to the Meraviglia Bar & Lounge is a chocolate bar boutique created by French patissier and chocolatier Jean-Phillipe Maury. The Jean-Philippe Chocolate & Coffee shop serves up hand-made chocolates and candies. Passengers also can create their own chocolates at the venue. Also created by Jean-Philippe Maury and located along the Galleria Meraviglia is Jean-Phillipe Crepes & Ice Cream, a gourmet ice cream parlor and French-style creperie. Also along the Galleria Meraviglia is the high-tech TV Studio & Bar. It's a multi-purpose venue that serves as a broadcast studio for on-board programming as well as a bar and lounge. The TV Studio & Bar is the site of live games, quizzes, talent contests and other events that can be broadcast around the ship. A bar in the corner of the TV Studio & Bar serves up a range of speciality cocktails and drinks. A traditional English pub also awaits passengers along the Galleria Meraviglia. Dubbed the Brass Anchor, it serves a wide range of beer including craft beers from the USA as well as whisky. The interior of the Brass Anchor Pub. MSC Meraviglia's Brass Anchor Pub serves a dozen draft beers, an unusually large number for a cruise ship bar. The diverse array of selections include the classic Irish stout Guinness and an India Pale Ale from U.S. brewer Lagunitas. Just off the Galleria Meraviglia on Deck 6 is Edge Cocktail, another bar. Located on Deck 7 along the Galleria Meraviglia, Kaito Sushi Bar is one of twelve dining venues on the ship. Kaito Teppanyaki is a 30-seat teppanyaki-style restaurant located along the Galleria Meraviglia. MSC Cruises has partnered with Italian chain Eataly to create a food market serving simple Italian dishes. Located on Deck 6 along the Galleria Meraviglia is Ristorante Italiano, a 56-seat Italian eatery conceived in partnership with 'slow food' Italian chain Eataly. A seating area in Ristorante Italiano. A large part of the lower deck of the Galleria Meraviglia is devoted to shops selling everything from perfume to clothing to toys. Among the shops along the Galleria Meraviglia are outlets selling clothing from various designers. MSC Meraviglia offers one of the largest casinos at sea, the Casino Imperiale. Located on Deck 7, just off the Galleria Meraviglia, the Casino Imperiale offers a wide range of table games including roulette, blackjack and poker. A large slot machine area also can be found in MSC Meraviglia's Casino Imperiale. At the center of Casino Imperiale is a circular casino bar. Located at the front of the ship on Deck 6, the Broadway Theatre is MSC Meraviglia's main showroom. The lounge with the most scenic views on MSC Meraviglia is the top-of-the-ship Sky Lounge. Located on Deck 18, the Sky Lounge features jazz music at night from a live jazz trio. Among MSC Meraviglia's included-in-the-fare main restaurants are the side-by-side L'Olive Doree and L'Olivo D'Oro. Located on Deck 6, they can accommodate 912 passengers at a time. A self-serve wine bar is located just outside the L'Olive Doree and L'Olivo D'Oro restaurants. Another main restaurant on MSC Meraviglia is Waves, located on Deck 5. Located at the top of the ship on Deck 15, the Marketplace Buffet is MSC Meraviglia's casual buffet eatery. It's open at nearly all hours of the day and serves a wide range of cuisine. MSC Meraviglia is one of the growing number of mega-ships with an indoor amusement area featuring such high-tech offerings as a Formula 1 virtual reality racing car. Located on Deck 16, the amusement area on MSC Meraviglia also has a flight simulator. A Star Wars battle pod also is among the amusements in MSC Meraviglia's amusement zone. It also has 4D theater and a video game arcade. MSC Meraviglia's amusement zone includes a large 'Sportplex' where passengers can play soccer and other games. It also is used for dance parties. Two full-size bowling lanes are part of MSC Meraviglia's amusement zone. The American-style Sports Bar is part of the amusement complex on Deck 16. MSC Meraviglia features a sprawling spa with 22 treatment rooms, a hair salon and a thermal area. Dubbed the MSC Aurea Spa, the spa area offers 19 kinds of massages. It's large thermal area includes specialized baths, showers and saunas. A relaxation room in the MSC Aurea Spa's thermal area. The Tepidarium Relaxation Room is part of the thermal area in the MSC Aurea Spa. A sauna area in the MSC Aurea Spa's relaxation room. A traditional sauna in the MSC Aurea Spa's relaxation room. A built-in armoire lines one end of balcony cabins on MSC Meraviglia. Balcony cabin storage areas have a personal safe and several drawers and shelves. Bathrooms in balcony cabins feature showers, toilets and a sink area. Desk areas in MSC Meraviglia cabins have two U.S.-style electrical outlets. The desk area in MSC Meraviglia cabins also have two European-style electric outlets as well as a USB outlet. A photo gallery located just off the Infinity Atrium sells camera equipment as well as passenger photos taken by on-board photographers. MSC Meraviglia has an extensive children's area on Deck 18 that includes rooms created in partnership with Chicco and LEGO. Among seven dedicated spaces for children at MSC Meraviglia's children's zone is the Mini Club Lego. It's a play area for children ages three to six. A bench in the MSC Meraviglia children's area is flanked by statues made entirely of LEGOs. The Teen Club on Deck 18 is a designed space for children ages 15 to 17. The Teen Club on Deck 18 has a dance floor. Like several earlier MSC Cruises ships, MSC Meraviglia has an exclusive area of cabins called the MSC Yacht Club that comes with its own private lounge (shown here), restaurant and deck area. 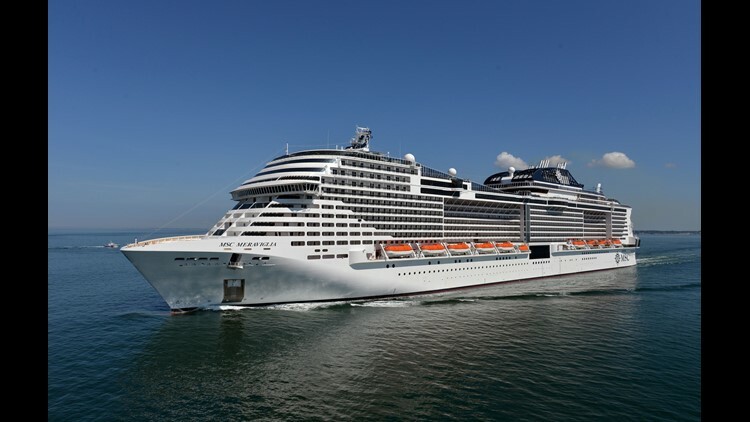 MSC Meraviglia's MSC Yacht Club has 95 cabins and is located across several decks at the top front of the ship. It's lounge has wall-to-wall windows overlooking the vessel's bow. The MSC Yacht Club has its own private restaurant that is exclusive to passengers staying in the complex. Located on Deck 18, it overlooks the front of the ship and is open for breakfast, lunch and dinner. Located on Deck 16, MSC Meraviglia's fitness center overlooks the ship's main pool area. MSC Meraviglia's fitness center offers a wide range of cardio equipment including treadmills, stationary bicycles and elliptical machines. There also are free weights and TechnoGym weight machines. A secondary room at the MSC Meraviglia fitness center is equipped with bicycles for spin classes. A stairwell in MSC Meraviglia. In one of its many configurations, the Galleria Meraviglia's giant LED ceiling douses the space in a green light. The Galleria Meraviglia's giant LED ceiling also has a red setting. Billed as the most luxurious cruise ship ever, the 750-passenger Seven Seas Explorer will be christened on July 13, 2016 by Princess Charlene of Monaco. Just behind the main pool is the Pool Grill, which serves grilled-to-order burgers, seafood, sandwiches and fresh salads. The Pool Grill has seating for up to 158 passengers at a time and is open for lunch. The coverage lounge area on Deck 11. A focal point of Explorer's interior is the two-deck-high Atrium, which features elegant twin staircases. Among the opulent touches on Seven Seas Explorer are intricate, inlaid marble floors such as this one at the base of the Atrium on Deck 4. A stylish hallway connects the Atrium on Deck 4 to Compass Rose, the ship's main restaurant. Compass Rose offers European-inspired Continental dishes in an elegant setting. Among upscale touches in Compass Rose, chargers and bread plates are by Versace. Elaborate glasswork serves as a focal point in Compass Rose. A closeup of the glasswork above the central tables of Compass Rose. A sunburst-shaped chandelier in Compass Rose. One deck up from the Explorer Lounge is Meridian Lounge, a bigger space that also offers live music. Meridian Lounge boasts an expansion bar. Meridian Lounge also has one of the largest dance floor on Explorer and a stage for live musical performances. A wide range of drinks are available at Meridian Lounge. Just across from the Meridian Lounge on Deck 5 is The Cafe, the Explorer's coffee bar. Seating areas with comfortable chairs are at the center of The Cafe's design. The Cafe has a self-service snack area offering pastries, gourmet sandwiches and homemade cookies throughout the day. In addition to barista-made coffee, The Cafe has a self-serve coffee machine tucked into a corner. Another new-for-Regent restaurant concept on Explorer is Chartreuse, which serves classic French fare with a modern twist. Chartreuse serves a range of soups, salads, seafood, meat dishes and pasta -- all with a French flair. A small bar area at the entrance of Chartreuse is a cozy spot for pre-dinner drinks. With a capacity for 108 people, Charteuse features a mix of traditional tabletops and cozy banquet seating. Tables for two line one of the walls of Chartreuse. Regent's signature steakhouse, Prime 7, can be found on Deck 10 of Explorer. Prime 7 offers a range of prime cut steaks and seafood. A small bar at the entrance to Prime 7 offers drinks before dinner. A hallmark of Seven Seas Explorer is its extensive art collection, which was hand-picked by Frank Del Rio, the CEO of Regent's parent company. Here, a Marc Chagall print that hangs in the bar at the Prime 7 steakhouse. Explorer is home to several new restaurant concepts for Regent, including Chartreuse, which serves classic French fare. Reservations are required for Pacific Rim, which seats 86 people. Chopsticks are de rigueur in Pacific Rim. Pacific Rim has a wide variety of table sizes. The entrance to Pacific Rim features a massive prayer wheel that weighs more than 5,000 pounds and cost $500,000 to install. Also on Deck 4 of Explorer, just off the Atrium, is the ship's small casino. The Casino has more than a dozen slot machines as well as six table games. A corner of slot machines in the Explorer's casino. Located just off the Atrium on Deck 4, the Explorer Lounge is cozy space for a pre-dinner cocktail or nightcap. The cozy bar at the Explorer Lounge opens in the evening. A comfortable nook at the Explorer Lounge, which offers live music nightly. The stage in the Explorer Lounge. Located at the top of the ship on Deck 11, the Observation Lounge offers panoramic views of the sea. Floor-to-ceiling windows line the front of the Observation Lounge, offering lounge-goers stunning views over the bow of the ship. The Observation Lounge offers several cozy seating nooks with views of the sea. A neon-infused corridor on Deck 11 leads to the Observation Lounge. Located on Deck 11, La Veranda is Explorer's casual buffet eatery. La Veranda has a spacious buffet area where dishes are in some cases cooked-to-order. During breakfast, La Veranda serves made-to-order omelettes, cereals, fruit, pastries and more. Home-made pastries on display for breakfast at La Veranda. La Veranda offers outdoor seating overlooking the back of the ship. A hand-washing station at the entrance to La Veranda. Explorer offers a well-stocked library that also serves as a comfortable retreat. Located on Deck 11, it's called, simply enough, The Library. A faux fireplace surrounded by large leather chairs is among the charms of The Library. Also on Deck 11 of Explorer is the Connoisseur Club, a smokers lounge that is open 24 hours a day. The Connoisseur Club features fine cigars and spirits such as Scotch whisky and Cognac. Explorer is home to an upscale spa operated by spa company Canyon Ranch. Located at the back of Deck 5, the Canyon Ranch SpaClub is open to passengers ages 18 and up. A hallway in the Canyon Ranch SpaClub leads to treatment rooms. The Canyon Ranch SpaClub on Explorer has eight treatment rooms. Treatments range in price from $175 to $601. Two of the treatment rooms at the Canyon Ranch SpaClub are configured for facial treatments. The Canyon Ranch SpaClub on Explorer also has a couples treatment room. The couples treatment room has a spa tub that is used with some treatments. Four heated chaises are located in a relaxation room at the Canyon Ranch SpaClub. The Canyon Ranch SpaClub facilities include changing areas and locker rooms for both men and women. A therapeutic shower area in the men's side of the Canyon Ranch SpaClub. Both the men's and women's sides of the Canyon Ranch SpaClub have a Cold Room. In an unusual twist for a cruise ship spa, the Canyon Ranch Spaclub features saunas that use infrared light instead of traditional heat. The Canyon Ranch SpaClub has a salon area offering hair stylish and nail treatments. Chairs for pedicures are located in the Canyon Ranch SpaClub salon. A desk set up for nail treatments in the Canyon Ranch SpaClub salon. Just above the Canyon Ranch SpaClub, on Deck 6, is Explorer's Fitness Center. The Fitness Center is home to 43 machines, including spinning bicycles. Explorer is home to the first cooking classroom on a Regent ship. Dubbed the Culinary Arts Center, it features 18 cooking stations. Classes taught by trained chefs cost $89 per person. Deck 4 is home to a boutique area that offers high-end clothing, jewelry and handbags. One of several boutique spaces on Deck 4 is devoted to clothing. Handbags line the wall of one of the boutiques on Deck 4. A reception area is located on Deck 4 near the main entrance to the vessel. Next to the reception desk is a Destination Services desk where passengers can arrange shore excursions. The reception desk is along one side of a large entryspace to the ship that also features comfortable seating. A small lounge area is located across from the Reception area on Deck 4. The Atrium as seen from Deck 5 looking down on the central staircases. The Sports Court area at the front of the ship on Deck 12 offers a bocce court, among other amusements. Seating for two lines Deck 12 overlooking the main pool. The long, rectangular pool atop Seven Seas Explorer features Regent's logo. The pool area contains a single, rectangular pool that is filled with salt water. Additional towels are located in teak holders alongside the pool. A buoy on the top deck of Seven Seas Explorer. Luxury line Regent Seven Seas Cruises in 2016 debuted what is widely regarded as the most spectacular suite ever built on a cruise ship: The Regent Suite on the new Seven Seas Explorer. Spanning the entire front of one of the ship's top decks, it measures 4,443 square feet -- more than 50% larger than the average home in the United States. The Regent Suite is priced at $10,000 per day, making it one of the most expensive accommodations on a cruise. The fare includes a wide range of perks including First or Business class airfare to and from the ship as well as private sedan transfers to and from airports. An elegant golden chandelier sits above the Regent Suite's dining table. The suite comes with a private butler who will serve meals at the table upon request.